Bottom Line Up Front: This is a 4.5 out of 5 stars album that’s going to win you over with its completely over the top compositions and simple but often clever lyrics. Some Nights may have put fun. at the top of the charts and won them multiple Grammys, but Aim and Ignite is still very much worth your time. 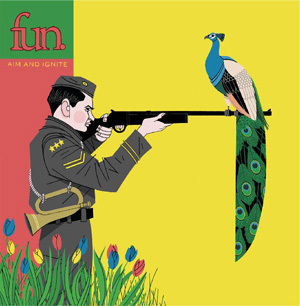 Artist Background: The band, fun., is made up of 3 main members: Nate Ruess, Jack Antonoff and Andrew Dost. There were 19 additional musicians that played on the album providing a wide range of instruments and vocals. You can’t do compositions like this without getting more people involved though Dost does play quite a few different instruments. The band started in 2008 shortly after Ruess’s band, The Format split up. Album Background: The album, Aim and Ignite, is described as indie pop/baroque pop. (Now where have I heard that before?) It runs about 43 minutes with 10 tracks. It received many positive reviews when it was released. On an interesting note, Take Your Time (I’m Coming Home) is unusually long at nearly 8 minutes. Favorite Track: My favorite track is I Wanna Be the One. It’s the 4th track on the album and is 3 minutes and 36 seconds long. While initially hearing this song, I thought Nate was singing about his daughter. But with further research, I think it is most likely about his newborn niece and him becoming an uncle given how long the song has been in the works. The song is about wanting to document a child’s life by writing songs about everything from their successes to their failures and all that lies in-between. In the age of Facebook, documenting everything about a child seems quite feasible. It includes several of my favorite lyrics such as “And I know that it’s been sang before but you’re my human holiday” and “Cigarettes are raining hard on the Upper East Side.” I particularly like the trombone, oboe and piano parts in this song. Overall, the arrangement is very upbeat and overflowing with joy. You can’t help but be happy after listening to it. Vocals Given how fun. was basically everywhere after We Are Young exploded, maybe some people are sick of hearing Nate. Don’t include me in this group. I absolutely love Mr. Ruess’s voice. He’s in my top 5 for favorite male vocalists of the past 10 years. I love his tone and his phrasing throughout the album. In addition, many of the supporting vocals work quite well on several tracks. The female vocals in At Least I’m Not as Sad (As I used to Be) are particularly appealing with them having a singsong nursery rhyme like quality to them. Lyrics The lyrics in this album are incredibly accessible because the word choice is simple as are the rhyming schemes. Given how complex the arrangements are on this album, the lyrics seem to be the perfect compliment. At the end of At Least I’m Not as Sad (As I used to Be), the line “I’m not a prophet, but I’m here to profit.” always stuck out for me. And in a verse from Light a Roman Candle with Me, I’m particularly fond of the rhyme between “…both wrote a sonnet, Together a sandwich with everything on it.” I think it’s a rather playful way to work sonnet into a rhyme. Walking the Dog also has a memorable couple of lines in the chorus with “If you could see me, Whoever I am. It’s not like a movie, It’s not all skin and bones.” This song reminds me a lot of the band, Vampire Weekend, for some reason. I think it’s the guitar part. Composition From the very beginning of the opening track, Be Calm, the music lets the listener know that tracks on this album are going to be beautifully layered songs with elements of classical music mixed with indie pop. There is so much going on during the songs with so many instruments fading in and out as the song is in a continuous state of rising and falling. However, it never becomes overwhelming but it does mean that it’s going to take multiple listens to really appreciate everything fun. brings to the album at any given moment. Of particular interest is The Gambler because I believe it doesn’t contain a single percussive instrument and instead relies on the piano to keep the tempo moving along. I would also like to note that until I started writing this review, I had no idea that Take Your Time (I’m Coming Home) was so long. I think that says a lot of the quality of the writing that I never became bored with that song or wish that it would be over already despite listening to it numerous times during the past week. Since I’m talking about this song anyways, this is the only song I noticed that uses a swear word. Thankfully, Nate uses the greatest and most versatile of all of the swear words available. Nothing There really isn’t anything that is so disagreeable that I would make a change to this album. The only reason I took off half of a star is because I’m not sure it’s going to appeal to everyone. But I think everyone should give it a listen to see if it does. In Conclusion: fun. put together a fantastic album with Aim and Ignite. It sounds like Nate was going through a lot of emotional stress after the break up of The Format, but it paid off tenfold in my opinion. This album is so much fun to listen to and can be returned to multiple times thanks to the elaborate arrangements. I liked this album from the very first listen and I don’t see that ever changing. Bottom Line Up Front: This is a 4 out of 5 stars album that you’re going to want to check out. It’s an interesting mix of the indie, pop and classical genres with a very high replay value due to enigmatic lyrics. 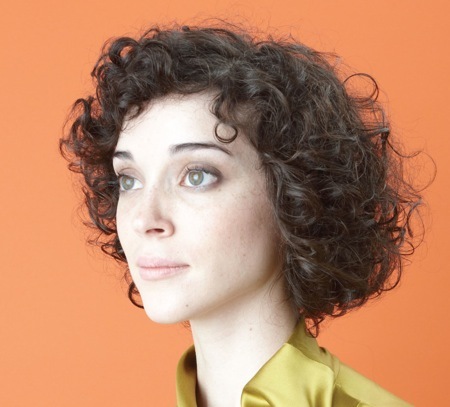 Artist Background: The woman behind St.Vincent is Annie Clark. She dropped out of Berklee College of Music after 3 years so she could start her professional career. It seemed to be a smart move on her part because she is an incredibly talented multi-instrumentalist and a highly skilled composer. Album Background: The album, Actor, is described as indie pop/baroque pop. It runs about 40 minutes with 11 tracks. Clark wrote it while watching lots of movies including many Disney films. The songs actually came from soundtracks she imagined for scenes from the movies she watched. She would then add the lyrics for it. The album was well received by many critics and made quite a few end of the year lists. Favorite Track: My favorite track is The Bed. It’s the 8th track on the album and is 3 minutes and 43 seconds long. St. Vincent’s use of contrasting ideas and sounds is prevalent throughout the album. I think she does a particularly good job on this track where she combines the viewpoint of young children with gun violence. The track begins with a pair of siblings hiding underneath one of their beds with their “dear daddy’s Smith and Wesson” ready to shoot and kill monsters. It’s a rather disturbing image but the track itself is very soft and laid back with her soothing voice and a guitar being gently picked. Further playing off the innocence of children to enhance the contradictions, many of the lyrics make references to common gun expressions includings “the whites of their eyes” which was made famous at the Battle of Bunker Hill in 1775 and “put your hands up” and “stop or I’ll shoot” which have probably been said at least once in every cop show ever made. This is just one example of where St. Vincent is masterful in mixing ingredients that don’t normally belong together to give the listener something new and delicious. Juxtaposition Both in her music and lyrics, Annie creates contrasts that are often quite jarring to the listener. In the opening track, The Strangers, after nearly 2 and a half minutes of her beautiful voice painting the black hole blacker and luscious multi-layered instrumentation, a blaring distorted guitar rips into the music. These contrasts only further enhance the qualities of the dissimilar approaches and strengthens her music overall. Mystery Even though I’ve listened to this album countless times over the past week, I’ve had a hard time actually deciphering what the lyrics mean. And this is a great thing. I love lyrics like this. I love it when they are very specific yet open to interpretation for those willing to dig into them. Actor would probably end up on my Desert Island list because of this. Tension In Black Rainbow, there is a wonderful crescendo that builds slowly and patiently using violins and distorted guitars. At some point, you’re really not sure if it’s ever going to come to a climax but eventually it collapses and you can finally start breathing again. It’s relentless attack reminds me of I Want You (She’s So Heavy) by The Beatles. Clockwork There is a lot of repetition in this album that works quite well. Multiple times, St. Vincent will switch between a phrase and a lyric like in The Strangers or alternate with sound processing like in Laughing with a Mouth of Blood. At other times, the instruments feel more like I’m listening to the rhythmic ticking of a clock more than anything such as in Marrow. Variation There isn’t a huge amount of variety between songs even if each song is well-crafted. Sometimes the tempo is mixed up to give it an almost dance song quality such as in Actor Out of Work. But I still feel the tracks on the album blend together more than I would like. This might be a side effect of the way the album was put together by starting out as mini-soundtracks for individual scenes from movies. In Conclusion: Annie obviously put a lot of thought into the music and I seriously doubt that there is a word or note that wasn’t carefully dissected before it was left in its final resting place. Actor is exactly what it should be. And you’ll most likely notice more and more little details each time you listen to it such as the silence used in The Bed or the wonderfully slow build up in Just the Same But Brand New.